Wisconsin moved up one spot to No. 4 in this week’s Associated Press top 25 poll — the first time the Badgers have been this high since a three-week stretch in 2011. Tempering the enthusiasm a bit, however, is that Wisconsin gained only 15 votes from last week and are expected to be ranked lower in the first college football playoff rankings, which come out Tuesday night. The Badgers did receive one No. 2 vote (from Jeff Miller of the Orange County Register) and 11 AP voters have Wisconsin at No. 3 in their Week 10 ballot. However, the majority of voters list Wisconsin at No. 5 or higher. 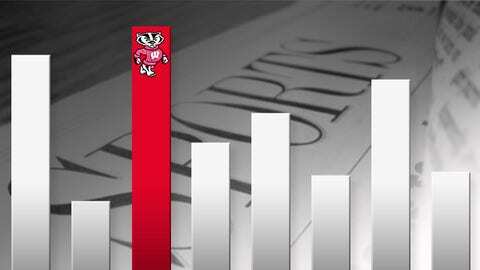 And three voters — John Adams, Kirk Bohls and Matt Brown — have the Badgers at No. 10. That’s the most voters having the Badgers with a double-digit ranking since Week 7 (only two did so the previous two weeks). Adams, of the Knoxville News Sentinel, has moved Wisconsin down one spot in each of the last two weeks. Sports On Earth’s Brown moved the Badgers from No. 8 from last week while the Austin American-Statesman’s Bohls actually moved UW down from 11 to 10.